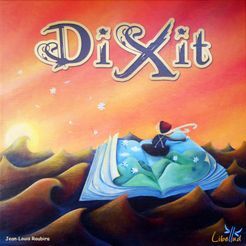 Buy Dixit and PriceWatch, Buy this board game at the Lowest Price. You find yourself staring at a hand of oversized cards covered edge to edge in strange yet beautiful artwork. It's sort of otherworldly and the longer you stare into the cards the more you see. A tiny detail there, some interesting elements here. One of these cards is trying to tell you a story, but which one and what story? It's the same story you're going to tell the rest of the table, but it needs to be subtle… hazy. Describing a card won't do, we need to filter it through our imagination first. The base game includes 84 over sized cards illustrated by Marie Cardouat, 6 differently colored rabbit shaped pieces to represent players and 6 colored chits for each player (36 total) used for betting. The box becomes the score track for the game, with the rabbits moving around a pond in the center that also acts as the card draw pile. The game also includes instructions in various languages. Each player has a hand of cards. The cards don't have suits or numbers on them, just artwork. The artwork is a little strange, but open to wild interpretation. People tend to each see something different in them. Each turn, one person plays "Storyteller". They'll say a phrase, sentence or whatever inspired by one of their cards and play it face down. Then the other players choose one of their cards that best represents that same phrase. Cards are shuffled and then turned up across the table, and players bet in secret on which card they think came from the storyteller. Players score points for betting on the storytellers card with additional points going to the storyteller and any player that had someone bet on their card. The crux of the game is that you as the storyteller get no points if either everyone or no one guesses your card correctly during the betting. So describing the card clearly or just making up something random gets you nowhere. You need to be referential, but not too direct. Vague but with a path to the answer. Cards and played, bet on and scored until someone has amassed a certain number of points or until everyone decides to stop. It's impossible to understate just how much the crazy and beautiful artwork on the cards brings to the game. Each card drawn elicits new responses from people, and their so ethereal that different people tend to find different things in them. More than once I've heard people say they want to frame a certain card or even take a picture of it for wallpaper on their phones. Dixit occupies that same sort of game space much of the enjoyment in the game is derived from finding the right game group. You're required to come up with a clue that's sort of vague but not really, and hoisting that creative requirement on some people can lead them to being frustrated. The game needs people that relish in stretching their creative muscles. The more literal minded player may not enjoy it. To help ease in new players I often tell people to start thinking about their potential clue a few turns ahead, since it rarely occurs to them and trying to think of something perfect while people are waiting is next to impossible. My favorite clues are the ones that inspire you to a certain extent, you take that clue and look at the cards and concoct a story in your head that goes along with it. Clues like "A most dangerous endeavor", "There's just no way to know for sure" or "The expectation is killing me!" are open ended enough that tons of things can apply, and while maybe not the best clue to get people to guess your card (and thus win the game) they tend to get the table talking. "Oooh, good clue!" is a common refrain and sometimes the real fun is not in winning the game but in talking about how you came to the conclusion of guessing certain cards. Dixit (to me) is more a social interaction game than a game you play to only win.